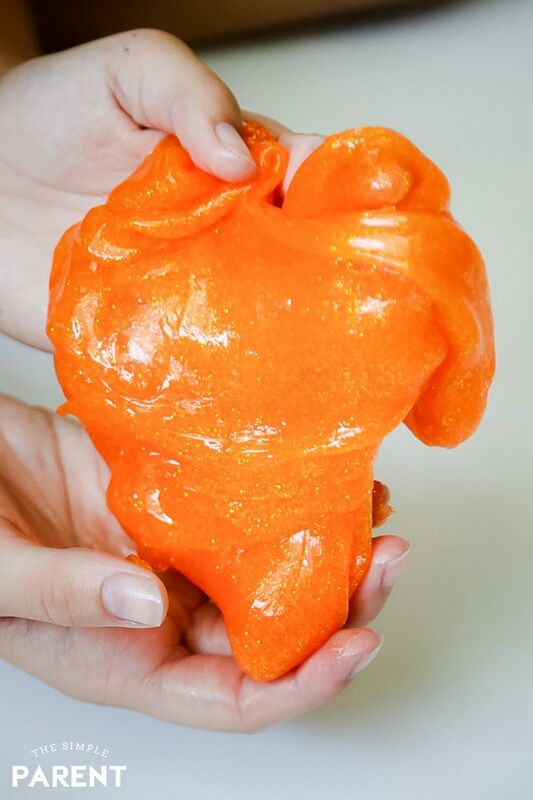 Home » Crafts & DIY » Orange Glitter Glue Slime for Halloween & Fall Fun! 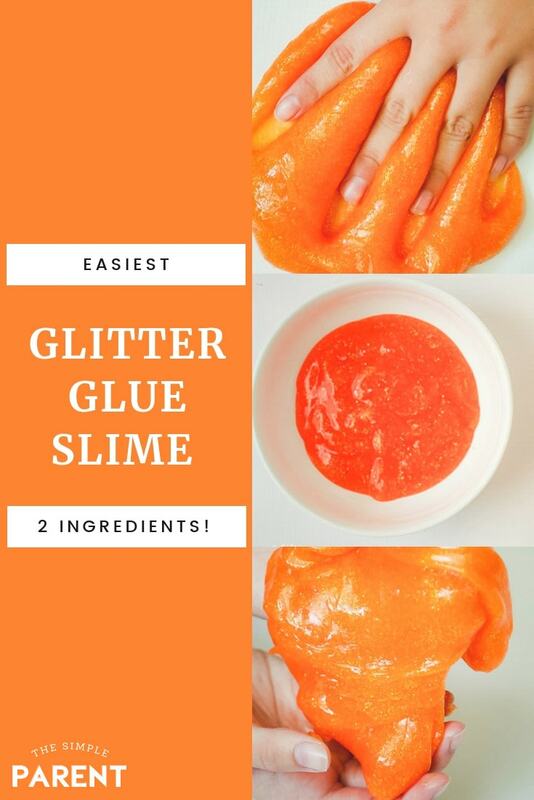 Orange Glitter Glue Slime for Halloween & Fall Fun! It’s that time of year — everyone is talking about pumpkins. Decorations for Fall and for Halloween are starting to appear on store shelves. Which means when my kids spotted the orange glitter glue, they wanted to make some because “it’s the color of Fall!” I can’t argue with that so we whipped up a super simple batch of orange Glitter Glue Slime. We like slime around here, but I’m the mom who needs it to be simple — especially if it’s going to be messy. The great thing about glitter glue slime is that it’s one of the easiest slimes to make! It’s pretty fool-proof too, which makes it perfect in our house! It’s similar to our blue fluffy slime recipe in terms of ease which makes it great for slime beginners! If you’ve made any of our other slime recipes, you know that I’m not a huge fan of Borax, I prefer to make slime without Borax. I’m all about the liquid starch and it comes into play in this slime recipe too! 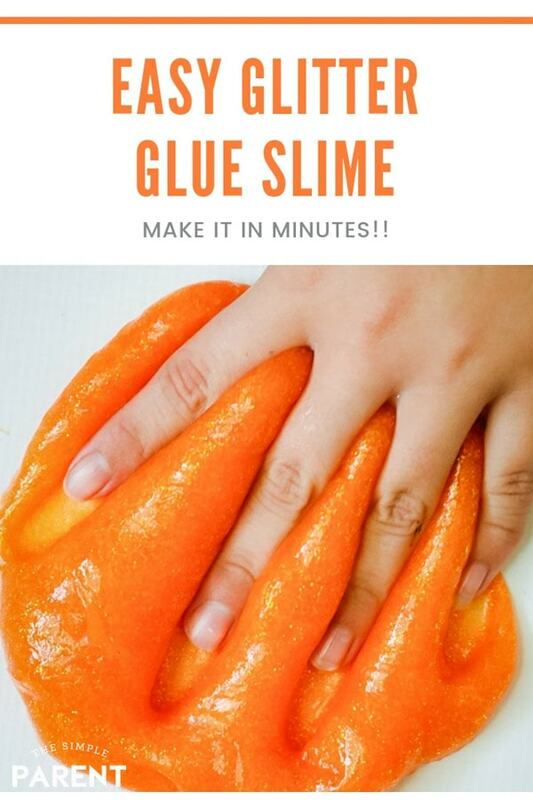 In fact, this orange slime is an easy two ingredient slime recipe! It’s the easiest way to make glitter slime! For this glitter glue slime recipe, we use glitter glue rather than our own glitter. So the recipe is a lot like our ocean slime recipe that we make with clear glue and LIQUID STARCH. WHY DO WE MAKE LIQUID STARCH SLIME? The simple answer is — I think it’s easier! Glue plus liquid starch is a great basic slime recipe that you can use to make as many different kinds of slime as you want! This recipe will show you how to make slime with glitter glue without Borax and I don’t think you’ll ever go back! You can use it to make glitter glue slime, fluffy slime, rainbow slime, and really anything you can dream up. You just add food coloring, shaving cream, glitter, sprinkles, confetti, and anything else to make it your own! But back to the glitter glue slime! 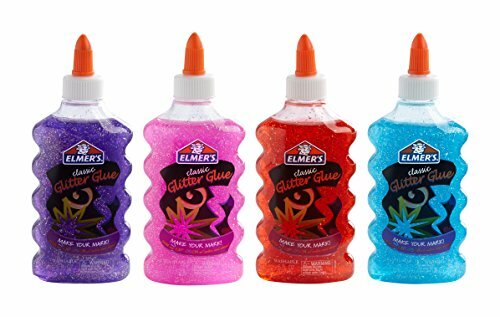 Since Elmer’s glitter glue is available in orange, we’ve got the perfect color for Fall or even better… the perfect color for Halloween slime! SAFETY NOTE: Even though we prefer liquid starch to Borax, it’s still the chemical component in our slime recipes that makes the magic happen. So SAFETY FIRST! Be sure to supervise kids if they’re doing the mixing. Wash your hands, any bowls and utensils used, and all the surfaces your slime has touched when you’re finished playing! First, you’ll need your two simple ingredients – Glitter Glue and Liquid Starch. Liquid Starch can be hard to find so we usually order a large bottle on Amazon. It’s the easiest way to stock up for slime making. We’re also some of those people who own the giant bottle of white glue! I’ll admit it! But they don’t make the glitter glue in large bottles so we have to make due with the smaller bottles. But I find that one bottle of Elmer’s Glitter Glue works well for a batch of slime. Then start adding your liquid starch and start stirring with a fork. Glitter glue slime is extra sticky. So don’t be afraid to add more liquid starch. Just go slow so you don’t overdo it! Once the slime starts to pull away from the bowl you’re mixing in, it’s ready to be pulled out. Start kneading it between your hands. Push it, pull it, and work the starch in. Don’t be afraid if you need to add more starch. Sometimes we have to use almost double our usual amount. As you knead it more (or play with it), the consistency should be there. If you need to add a bit more liquid starch, just add a bit at a time and work it in. This glitter glue slime recipe is as easy as it comes (as long as you don’t let the amount of starch stress you out like I did the first time we made it)! 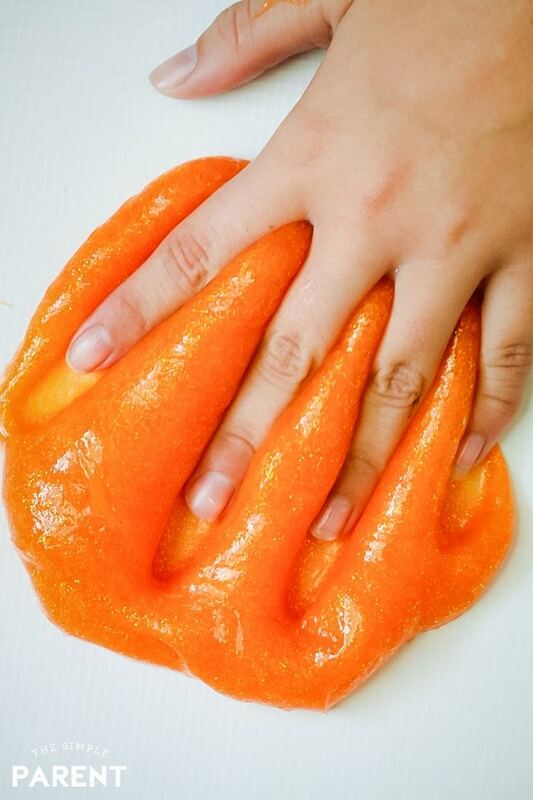 Then have fun playing with the gorgeous orange glitter glue slime just in time for all things pumpkin and Halloween! How do you make slime with glitter glue and borax? If you want to use Borax to make your glitter glue slime, you can do that too. Instead of the liquid starch, mix 1/2 teaspoon of Borax with about 1/4 cup of water. Then add it slowly to the glitter glue like you would add the liquid starch. You can definitely add glitter to slime. We prefer to use glitter glue to start with because I feel like the glitter shows up better. But if you use clear glue, you can add your own glitter after you dump the glue into the bowl. Fine glitter works better for the shimmery effect. We own this variety pack of glitter as part of our slime ingredients. Can you use glitter glue to make fluffy slime? Absolutely! Fluffy slime is one of our favorite slime recipes because it’s basically fool-proof. All you need to make fluffy glitter slime is Elmer’s glitter glue, gel shaving cream, and liquid starch. This fluffy slime recipe is a bit different than the one we make with white glue. You should use GEL shaving cream for the best fluffy glitter slime. Unicorn slime can be made with glitter glue slime. Make some small batches of different colored glitter glue slime. Then stretch them out into long strips and lay them next to each other on the table. Then twist them and stretch them to make Unicorn slime! You can see how we combine colors in our striped slime recipe. You simply combine it with liquid starch like we did in this recipe. If you’re using white Elmer’s glue, you won’t need as much liquid starch to make your slime. 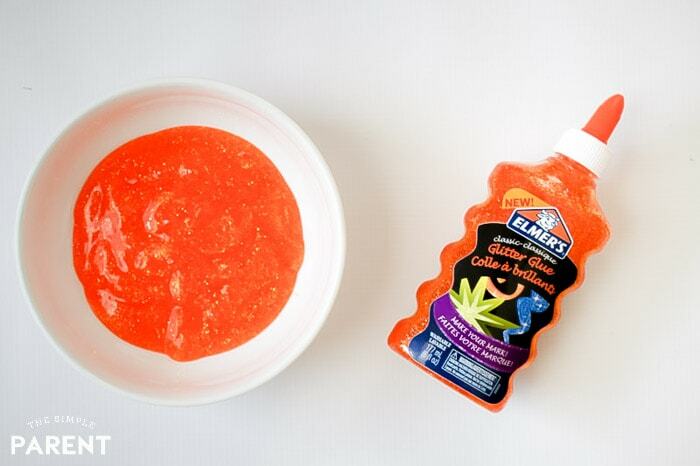 We prefer using Elmer’s glue for our slime. I just think it makes the best quality slime. Very pretty slime! If I didn’t have really bad anxiety about laundry detergent I’d try it for sure.